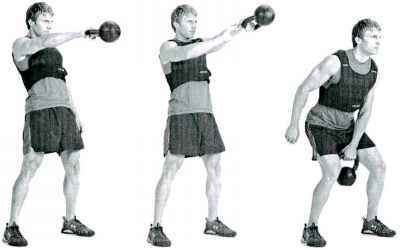 Hold the kettlebell in one hand and lower to the power position forward, hips back, and forearm in contact with your innerthigh. Swingthe dumbbell usingyour hip extension to drive the weight up. At the highest point of the swing, the kettlebell will feel weightless. At this point, switch hands in midair and immediately lower the weight back to the starting position with the other arm. One repetition is a swing with both arms. 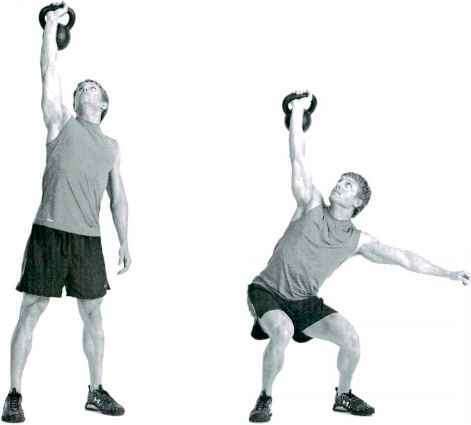 Press the kettlebell overhead with the weight resting on the outside of your forearm. With your feet a little wider than hip-width apart, descend into a deep squat while looking up at the weight. Push your hips slightly toward the kettlebell side to allow a slight rotation as you squat. Keep your hips back and your heels flat on the floor throughout the entire movement. Complete all the r p tions on the first side and then move to the other side. Stand with your feet in the side sumo base position, holding a dumbbell in each hand and hanging at arm's length in front of you. 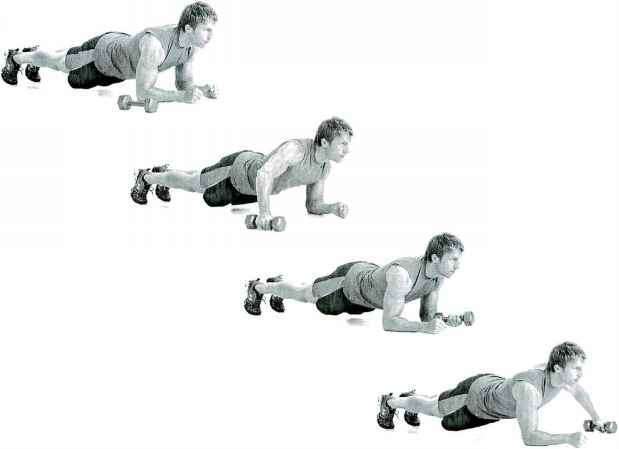 Lower down until the dumbbells touch the floor. 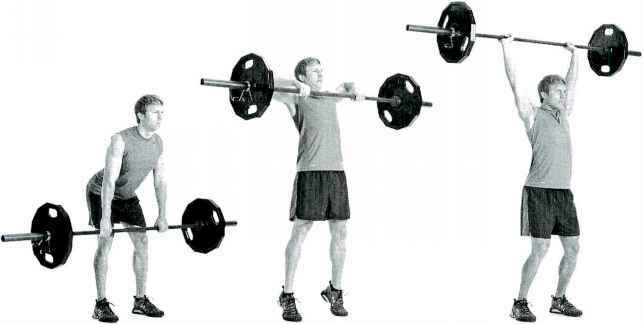 As you ascend from the squat, immediately begin curling the weights to your shoulders and then explode them overhead as you near the top of the squat (do a push press). Reverse all the movements to bring the dumbbells back down and into your next squat. In the starting power position, pull the kettlebell up and quickly flip the weight over so that it is resting at your shoulder, touching both your deltoid and forearm, with your elbow down. 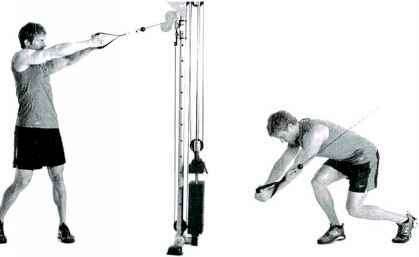 From here, sink your shoulder and hip on that side and forcefully drive the weight overhead. 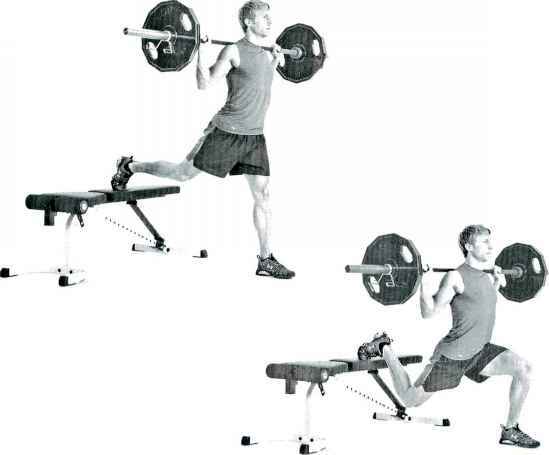 Lower the weight back down to the starting position for the next rep. Complete all repetitions on one side before moving to the other side. 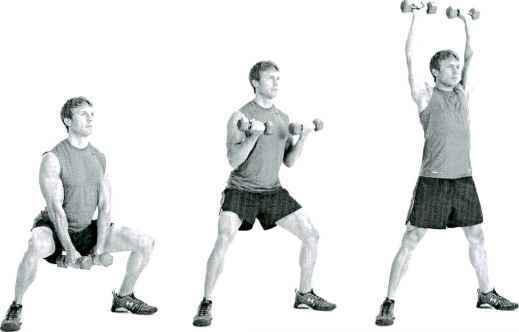 Hold the kettlebell in one hand and lower to the power position with your shoulders forward, hips back, and forearm in contact with your inner thigh. Swing the dumbbell using your hip extension to drive the weight up. At the highest point of the swing the weight will feel weightless at this point switch hands in midair and immediately decelerate the weight back to the starting position with the other arm. One repetition is a swing with both arms. Stand holding the rings out in front of you with your arms extended. Move your feet slightly in front of you and lean back so that your weight is pulling on the rings. Squat deep and jump as high as possible as you simultaneously pull downward with your hands to help facilitate a greater jump. 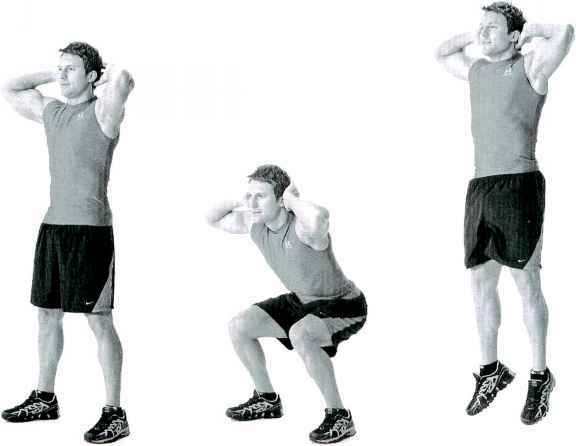 As you descend, offset your weight with your arms and sink back down into your next squat jump. You should almost be jumping in an arclike movement pattern due to the rings acting as an anchor. A barbell with a handle bar attachment works best on this exercise, but you can also perform this exercise without the attachment. Holding the bar high either on the handles or by grasping the end of the bar, keep your body tall and your core tight with your knees slightly bent. Let your arms rotate to one side as if you are trying to draw a large circle with the tip of the bar. Move as far as possible without letting your core collapse before repeating in the opposite direction. 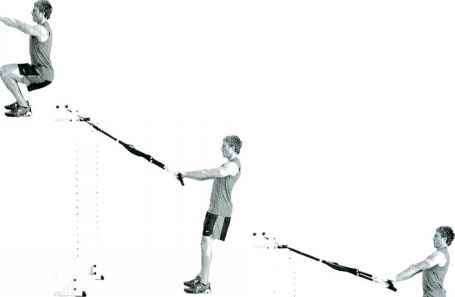 In the power hang position, extend and shrug the weight upward while finishing with a pulling of your arms, trying to move the weight toward your chin. At the high point of the pull, rotate your elbows under and around the bar and catch the weight at your shoulders as you drop into short quarter-squat position. Sit on a bench facing a sturdy box and place your hands behind your head or across your shoulders. After sitting for a few seconds, jump up as fast as possible without rolling forward and land on top of the box. Step down and sit back on the bench to get ready for your next rep. You can make this exercise more difficult by lowering your sitting position using a smaller bench step or even sitting on a medicine ball. In addition, you can hold weights on your shoulders or wear a weighted vest.